Little did Steve’s dad, Ray, realize as he laid bricks and helped pour cement back in 1959, that he was shaping the foundation for much more than Mercy Centre, which was being built to house Catholic Charities’ special education and employment-support programs. 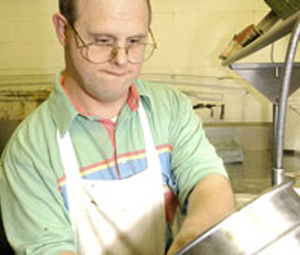 That same year, Ray’s youngest son, Steve, was born with Down Syndrome; and, in 1962, Steve became one of the first students to attend Mercy Centre’s pre-school program. Over the years, Steve not only learned life’s basic skills at the Centre, but also participated in vocational training and athletic programs. Mercy Centre’s Adult Services efforts have helped Steve and many others to find jobs in the community. And thanks to this comprehensive training, as well as his own personal fortitude, Steve, in his forties, became an exemplary worker at his competitive job in the kitchen of the College of the Holy Cross. At the same time he was also especially helpful to his mother as she aged, taking care of many things around the house follow the passing of his dad. After his mom passed, Steve has been living with his older brother. An independent worker, Steve has become a productive member of society, but more importantly, he has also developed strong feelings of pride and accomplishment. He readily shares his positive attitude and lends his support to others. “Steve is a fine gentleman, and he’s been a great help and inspiration to many,” says Steve’s case manager at Mercy Centre. Steve, now in his fifties continues to work at supervised community sites. Steve’s father helped lay the foundation that would ultimately support both Catholic Charities’ efforts at Mercy Centre and the life of his youngest child. Steve is well aware of the role his father played in building Mercy Centre, the place that has given him so much. Now he is giving back all that he can to his co-workers, and the community at large.